Norma Starr, one of the last great silent screen stars, made her share of enemies during her career and she’s gathered all of them for her birthday celebration – her director, a rising starlet, her shifty agent, a handsome matinee idol, her costume designer, her maid, and her oldest friend, who carries a dangerous secret. As they all watch, Norma relishes a chocolate covered cherry from a box given anonymously. At that moment, she dies. Det. Larry Stark, L.A.P.D., and his tactless assistant, Roscoe, invite all the suspects to a “reunion” party during which secrets are revealed and a clever trap is laid. A play within a play, which begins as a murder mystery, but the murder victim won’t keel over. 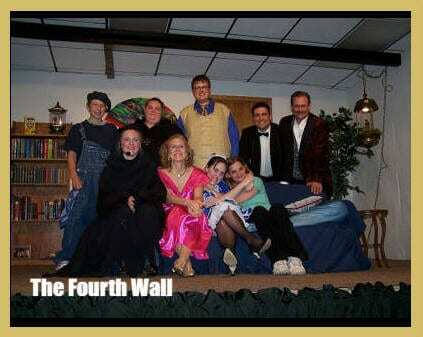 The playwright forgot to give the characters names, and even the ending of the play stinks! Everyone is supposed to die and then the character Death is supposed to do an interpretive dance. Thankfully, the audience’s agony is cut short halfway through when the actors break character because Death accidentally kills the Host and then leaves the set to move her car. Without Death, how can the play go on? But all is not lost. With such a rotten ending and no director or playwright in sight, ad-libbing can only improve the play. How will the play end? No one is sure – not even the actors! This entry was posted in Past Productions, Play, Uncategorized on May 18, 2007 by packerland.